The American Conservative Union (ACU) was founded in 1964 at a time when the conservative movement was in its infancy. Barry Goldwater had just lost a crushing election, but something new was starting. The ACU served two purposes – to consolidate conservative gains and to define its boundaries. The new organization brought together conservative thinkers to formulate the ideology and was part of the movement to distance conservatism from the John Birch Society, a conspiracy minded group that tried to claim association. In 1973, the ACU held the first annual Conservative Political Action Conference (CPAC) to bring together conservatives from across the country. It is one of the major events for conservatives, and proudly boasts of regular attendance by conservative icons such as Ronald Reagan, who headlined the very first CPAC. I have attended CPAC for the last four years, including this weekend, and have noticed a startling change this year. Trump spoke at my first CPAC in 2013. He was criticized by other speakers for his liberal views before speaking to a sparse crowd. Last year, during the Republican primary, Trump cancelled his appearance at the last minute when it became clear he would face a hostile crowd. This was not just because of normal politics. Cruz showed up and received rapturous applause. Rubio fought through the flu to attend and was widely praised. There were partisans for both senators, but neither felt the other’s supporters would boo them off stage. That is because they are both clearly conservative. Trump did not have that security. This year was different. The first speaker at CPAC 2017 was Counselor to the President Kellyanne Conway, who on Thursday morning joked that CPAC would become TPAC (Trump Political Action Conference). Unfortunately, she has turned out to be correct – at least partially. Ted Cruz and Scott Walker delivered strong conservative messages this year, but most of the big name political figures were from the Trump administration and promoted his unconservative worldview. However, most of the policy wonks were the usual conservative thinkers that have presented at CPAC for years. This set up an interesting, or perhaps confusing, dynamic. 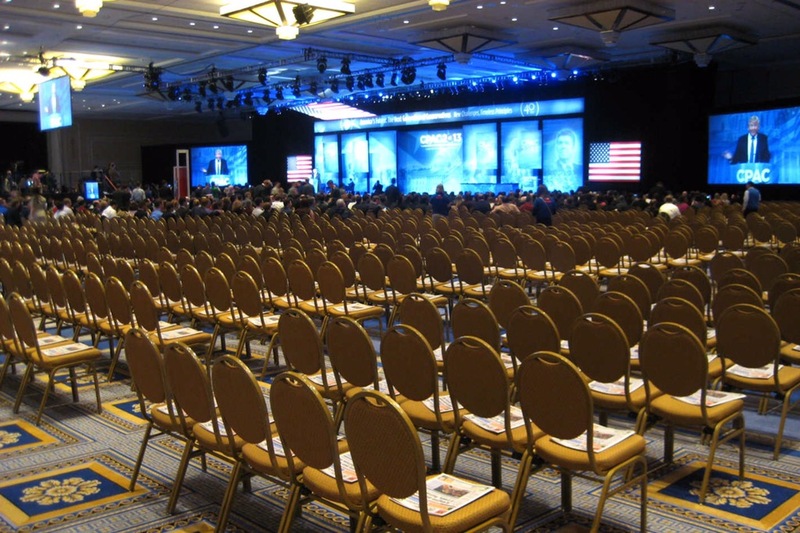 CPAC attendees gave raucous applause to both free trade and protectionism. The executive director of the ACU delivered a firm condemnation of the “alt-right” just a few hours before Steve Bannon, who said his website Breitbart.com was a platform for the “alt-right,” was glowingly interviewed by the chairman of the ACU. As you might expect there was strong support for laissez faire economics, but also cheers when Trump advocated crony capitalism and an infrastructure stimulus bill. The crowd booed the Kelo decision that allowed the government to seize property through eminent domain and give it to a private business just an hour before cheering Trump, who enthusiastically supports and participated in such eminent domain abuse. There was the normal condemnation of socialism one would expect from a gathering of conservatives, and, I can’t believe I’m writing this, those same people cheered admitted socialist Bernie Sanders for his trade policies. There have always been policy disputes at CPAC. Part of the conference’s purpose is to debate competing conservative ideas. But protectionism has never been and is not conservative. “Alt-right” is a term coined by wannabe Nazis who seek to replace conservatism as the intellectual base of the Republican Party. Crony capitalism and eminent domain abuse have been roundly denounced by conservatives as big government interference in the free market since the beginning. That any of these would be received with applause rather than boos at CPAC is disheartening. There is a big debate about where conservatism goes from here. Is conservatism changing? That’s a very difficult question to answer at this point. Yes, self described conservatives at CPAC cheered Trump proposing liberal policies. But at the same time, they continued to support traditional conservative values when articulated by people that don’t have the tainting influence of celebrity. Additionally, several people in 2016 tried to run for office as mini-Trumps in Republican primaries for Congress and went down in ignominious defeat. It is hard to tell so early in the Trump era, but it seems as if great deference is being given to Trump as the most powerful Republican, but most conservatives have not abandoned our ideals. It appears as if CPAC attendees did not surrender their conservative principles so much as place party loyalty above them. That is not an ideal situation, but it is better than the alternative. Or maybe this is just me searching for a silver lining in a time that does not warrant optimism. Time will tell.